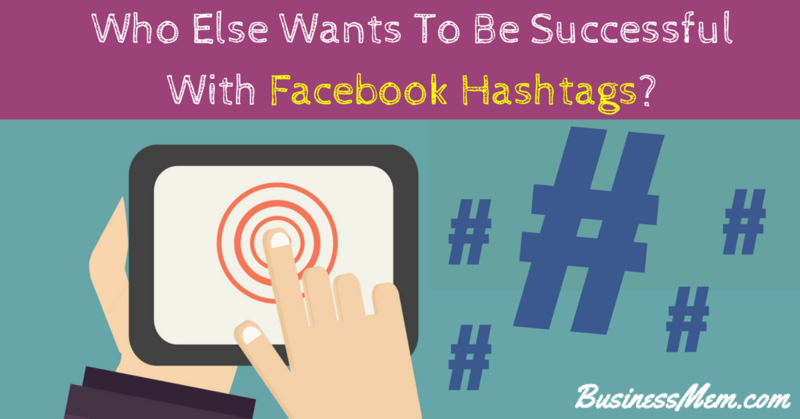 Who Else Wants To Be Successful With Facebook Hashtags? There’s been a lot of debate about whether or not Facebook hashtags actually work or if they’re a total waste of time. 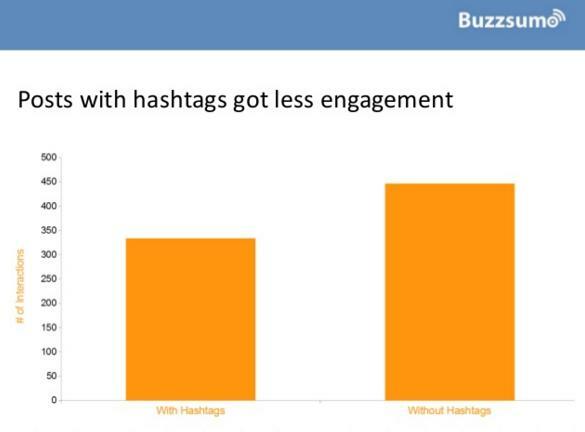 The evidence seems to suggest that using hashtags can actually DECREASE your engagement. But, things are rarely that cut and dry. Shortly I’m going to show you a powerful strategy to skyrocket your reach and engagement using Facebook hashtags (despite what the experts say). But before we get to that, let’s take a look at the evidence. Using Hashtags On Facebook: The Studies! The two best studies on the use of hashtags are from Buzzsumo who’ve analysed over 1 billion posts, and SocialBakers who analysed over 200,000. To briefly summarize what they found I’ve included the most important charts below. In both cases (and plenty of other studies too) the research seems pretty conclusive. Using hashtags in the traditional fashion has no benefit whatsoever. In fact, it actually decreases engagement. That’s not to say hashtags shouldn’t be used at all. After all, not all posts are the same. In order to get any sort of engagement from Facebook hashtags you’re going to need to ‘newsjack’ trending news. And you’re going to want to do so by using a video. I’m going to show you how it’s done in a second, but before I get to that let me quickly touch upon what newsjacking is in case you’re unfamiliar with the term. Applying this to Facebook, what this basically means is if you want to use hashtags on Facebook, the best way to do it is to jump on the bandwagon of something that’s trending right now. And you’re going to need to use Facebook Live in order to do it. Take a look at Trending Topics on your News Feed. Very often they’ll include hashtags. 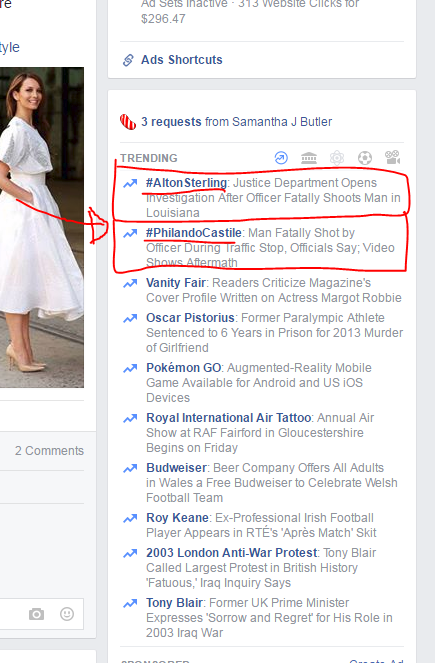 At the time of writing this, the two top trending stories on Facebook are both hashtags related to the police shootings of Alton Sterling and Philando Castile. When a user clicks on these hashtags, they’ll be able to see all public posts relating to it. So, in this example, here’s how it looks for me when I click on the top hashtag. Now, the results at the top of the page tend to favor large sites and media organizations. That’s just how it goes, there’s not much we can do about that especially for such a serious topic such as a police shooting…. 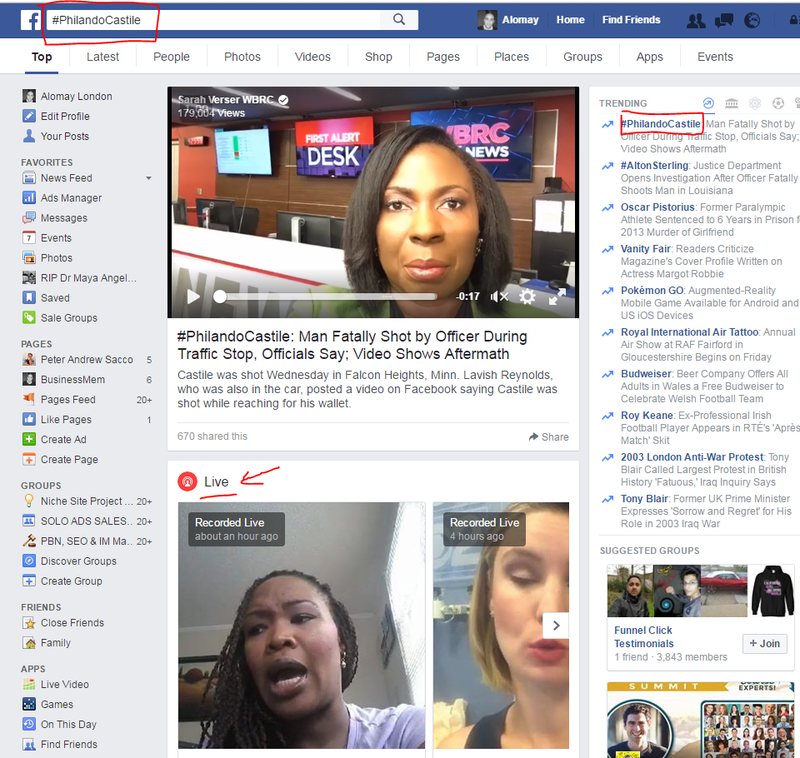 However, notice how beneath the top story the first thing Facebook shows is results for Facebook Live (their new video steaming feature). In this example, both the broadcasts that are displayed have actually ended, however they’re still showing under the Live section because they were filmed using Facebook Live. Live doesn’t mean it’s streaming right now. Live means it was filmed using Facebook Live. If you’re not familiar with how to live stream on Facebook this guide will walk you through all you need to know. 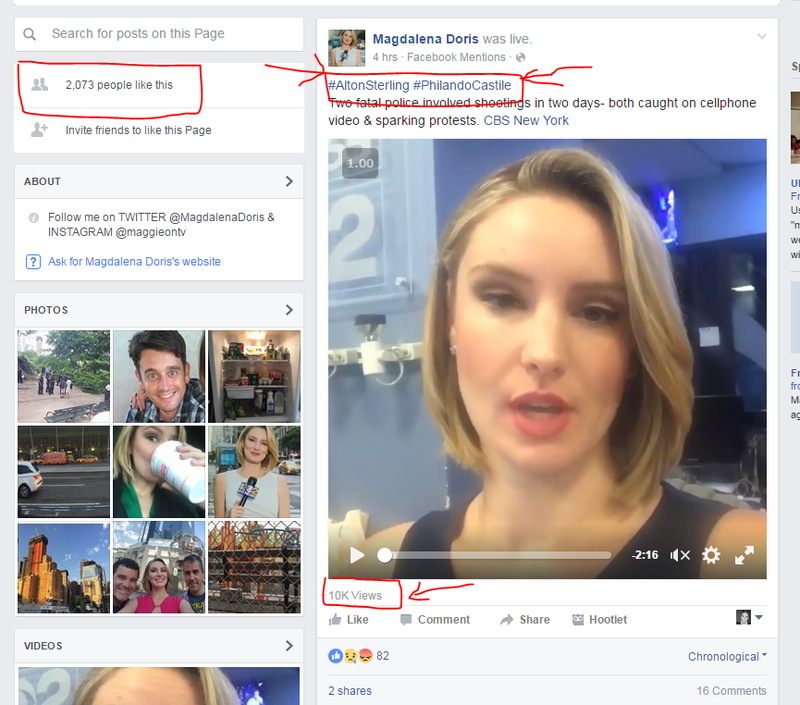 Videos filmed on Facebook Live are being given preference on the Trending search page way above text and image statuses which are right down at the bottom of the page. Now here’s the important bit – listen carefully. In order for your video to show up in the Live section, you need to include hashtags so that Facebook knows what the video is about (we’ll get to this shortly)..
At the moment, this is where the biggest opportunity lies with using hashtags; newsjacking trending hashtags and creating a Facebook Live video about it. Let’s look at the two ladies who appear in the search results in the screenshot above. Every time I refresh her page the view count on her video keeps rising. 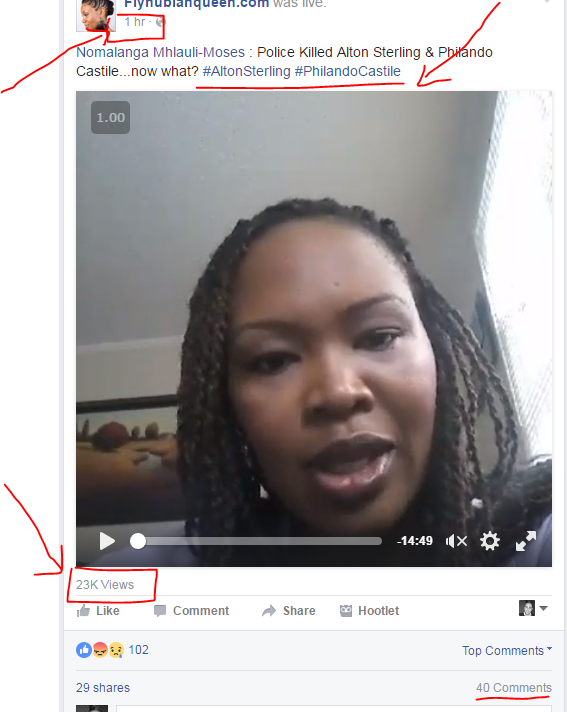 When I started writing this post her view count was at 12,000. Now it’s at 23,000. No doubt by the time you’re reading this it’ll be higher. When I mentioned earlier that you need to add hashtags to the video so Facebook knows what it’s about, here’s what I meant. You’ll notice that she’s used both the trending hashtags in her status, and she’s also used the words themselves too, not as hashtags but as words. Clever strategy – this lady has been very intentional with what she’s done, and she’s clearly received great engagement as a result. 2 related hashtags = double bang for her buck. She’s not a media organization…it’s just one woman broadcasting out of her bedroom. And yet there she is above some of the largest organizations in the world. Now, let’s address the issue of page likes. Does the fact that this lady has a quarter of a million page likes help her? Well, let’s look at lady 2 – embedded video below. You’ll remember that she was second in the search results but that her video was shot 4 hours ago vs lady one’s which was shot 1 hour ago. Again, like lady one, lady two has used both the hashtags that were trending this time at the start of the status. So getting onto the issue of page likes…her page only has 2,073 likes…. ….and yet her views exceed 10,000. In other words, she’s reached an audience 5x greater than her page likes. Impressive! To me that’s clear proof that a combination of jumping on a trending hashtag + recording a video using Facebook Live + incorporate the hashtag (and possibly the word too) within the status DOES boost your reach and your engagement significantly. Forget what the studies say. This works! Before you try this out, I’d like to offer a word of caution. It’s important to pick the trending topic you’re going to be newsjacking carefully. Trying to newsjack a serious story like a shooting isn’t something I’d recommend because the idea of using someones death as a launchpad for promotion doesn’t sit well with me. I’d much prefer to newsjack something more lighthearted and fun like celebrity gossip, a new movie release etc. That said, each to their own. I’m going to show you what you could do based on what’s trending now as I write this post. So…in order to newsjack you need to get good at transitioning from the subject matter of the hashtag back onto whatever it is you’re trying to promote. With a bit of creativity it’s possible to do for most topics. Let’s say you’re a nutritionist and you wanted to use the hashtags from above. The problem for a nutritionist is there’s no obvious link between a shooting and nutrition, right? Well, here’s how it could be done. Proceed to give a quick summary of what’s happened. “The world’s going crazy..people just aren’t safe anymore, even from the police…Is it any wonder parents don’t want to let their kids out? Kids are spending hours in front of TVs instead of being out and about getting exercise. [Complete the transition] – tie the two topics together then move onto your subject matter. 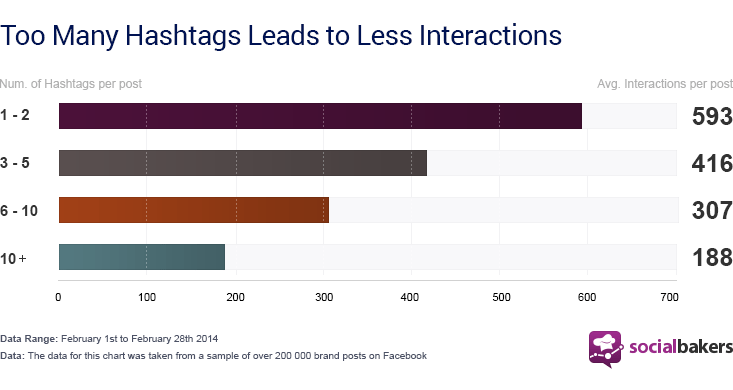 So there you have it – are Facebook hashtags dead? For posts, maybe. The studies certainly seem to suggest so. But are they a complete waste of time? If you’re able to jump on a trending story and you’re happy to broadcast a video, you might actually get more reach and engagement than ever before. Have you tried this out? Leave me a comment below and let me know how it worked for you!